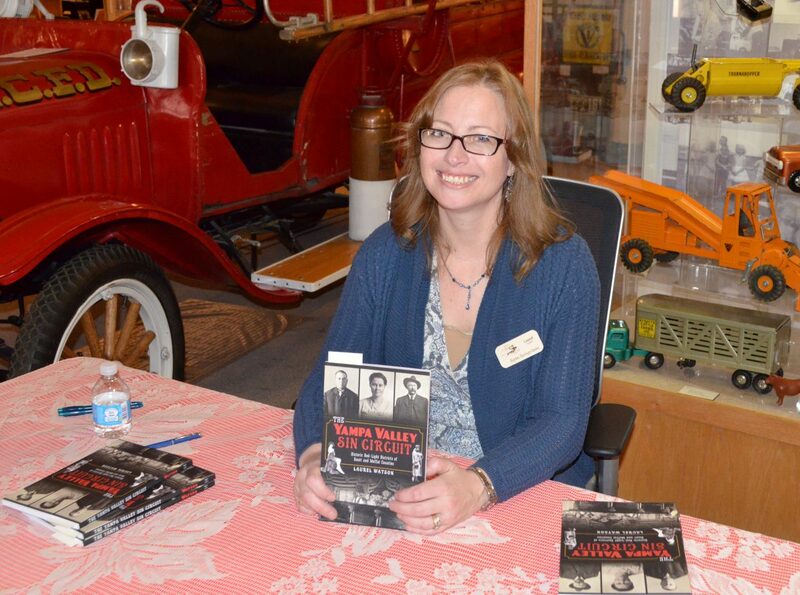 Laurel Watson, curator of the Hayden Heritage Museum, with her book "Yampa Valley Sin Circuit: Historic Red-Light Districts of Routt and Moffat Counties" at the Museum of Northwest Colorado on Saturday. A steady stream of visitors stopped by the Museum of Northwest Colorado on Saturday to talk about some of the untold and lesser-known stories of the Yampa Valley’s past. Laurel Watson, curator at the Hayden Heritage Museum, was at the museum to do a signing of her first book, “Yampa Valley Sin Circuit: Historic Red-Light Districts of Routt and Moffat Counties.” Watson’s book focuses on some of the more sordid historical details that came with settling Northwest Colorado, in the saloons and brothels that came along with the mines and Moffat Railroad. Her stop at the Museum of Northwest Colorado was the latest in a series of signings and presentations she’s done in Steamboat, Hayden and Craig, with more engagements planned in Moffat and Routt counties up until county fair time, she said. In Craig on Saturday, patrons came for the book and the majority stayed and chatted with the author about her work and her findings. Reading about those new stories was why Howard Morris, of Craig, came by Saturday. A first-time visitor to the museum, Morris said it was Watson’s title that piqued his interest. Morris said he hoped to read some stories that he could turn into a song eventually.